The homestead has been pretty idyllic with the days getting longer. We celebrated an unseasonably warm February by planting a long-sought-after fruiting red-leaf plum. 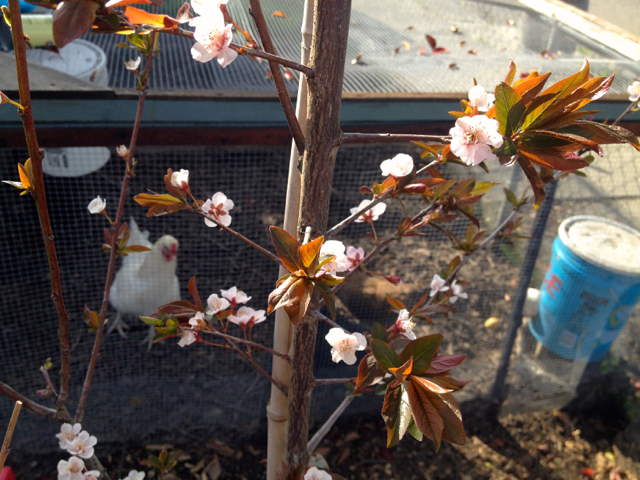 Brave Irene, our Delaware hen, is keeping an eye on those blossoms for good things to come. We’ll do some grafting and pruning so this lady grows low and bountiful. We popped her in the ground right next to the chicken run so that when and if we can’t keep up with the plum glut, they’ll be easy to toss in for the chickens. Ah yes. 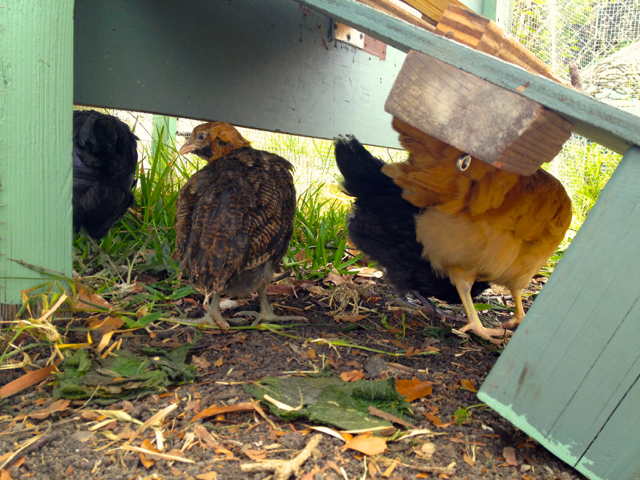 The chickens. Those longer days have turned our 0 or 1 egg days into 3 or 4 egg days, so omelettes are back in season! But along with our egg bounty came The Mutiny. It started innocently enough. I peeked into our nest box one afternoon and found a cracked egg. While I sighed over the loss, I wondered if any of the girls had helped themselves to a sample. Somebird must have. In the following days, instead of eggs, I found yolky wet spots in the nest box. I’d heard about this dreaded development–the Marxist chicken revolution. Apparently, once chickens get a taste for their own eggs and owning the means of production, the habit can be pretty hard to break. 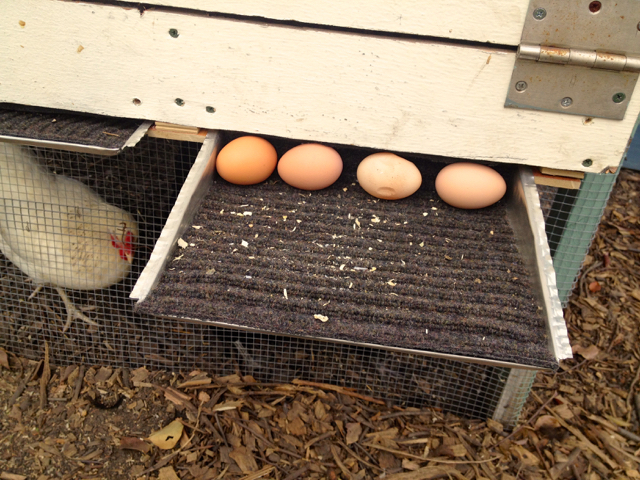 I tried collecting eggs more often and put some golf balls in the nest box as a decoy. This did not break their revolutionary spirit. Yolky wet spots abounded. I suspected Mavis, our Auracana. She was the sweetest little sweety as a pullet, sitting on my shoulder and burrowing into my hair for comfort. Gone are the days of my sweet little Mavis. So I couldn’t stop a satisfied “I knew it!” from escaping my mouth the day I caught Mavis in the act, gulping down broken shell with the glisten of yolk on her beak. After that, I stomped into the house and broke out the big guns: emptied some store-bought eggs and coated the insides of the shells with dijon mustard. I popped those little dijon bombs back in the nest box and thought I might have won when Mavis rejected the shells after a single, suspicious peck. Instead, she got a recruit. The next day, Mavis and Rosie were at it together. And LemonCake might have been in on it too. Mutiny. I was incensed. I fantasized about slitting chicken throats to protect the daily food source for my lean, sunburnt family, just trying to survive out on the frontier. Luckily, my smart homesteader friend R, the one who used to have the goats we milked, offered an alternative to death: the rollaway nest box. AJ and I spent all of Sunday retrofitting, and I am proud to say that our frontier spirit prevailed! 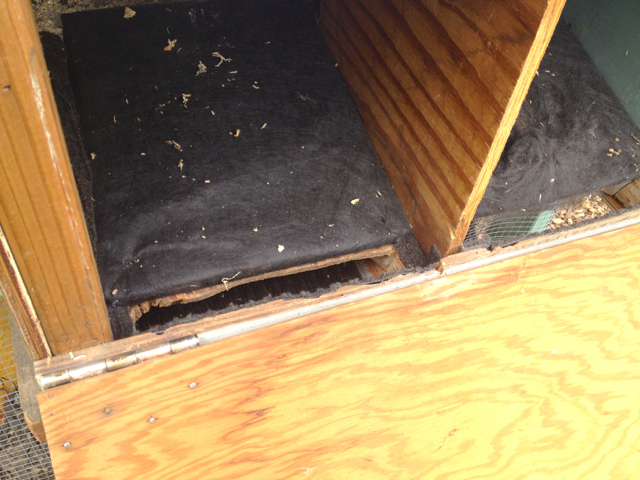 We set the nest box floor at an incline, so that once the deed is done, the egg rolls via padded board into a slot which empties into a padded aluminum paint tray. Brave Irene seeks out the camera yet again. I am proud to report that our frontier spirit prevailed! No yolky wet spots for the past 3 days. Means of production successfully wrested from Mavis’ crafty beak. That was fresh, funny, informative and ingenious! Loved this post!